Religious Zionists are usually the last types of Israelis to visit Berlin, let alone live there. As staunch nationalists loyal to the Jewish homeland, they’re often less forgiving of Germany’s dark past than their secular counterparts, who made Berlin a leading European destination for tourism and immigration among Israelis. 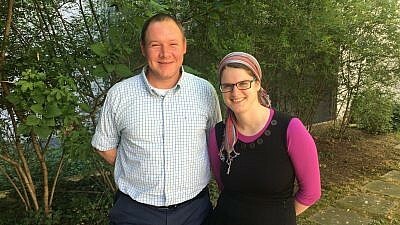 But two young Israeli couples—Eliezer and Rotem Noy, and Netanel and Tehila Darmon—have not only unexpectedly settled in Germany’s capital as emissaries but have built their respective homes in Berlin, where Jews of all backgrounds can connect with their roots, and feel a sense of Israeli family and belonging. “Both of us, ideologically, didn’t leave Israel before,” said 36-year-old Eliezer Noy, director of Morasha Germany, a national student organization that provides Jewish learning and social opportunities for Jewish students and young professionals throughout Germany. Eliezer grew up in Ramat Gan and studied at the Atzmona pre-military academy in Gush Katif before Israel evacuated the Gaza settlement bloc in 2005. Eventually, he completed his MBA at Tel Aviv University and worked as an accountant at the prestigious KPMG firm. Rotem, 32, grew up in a religious Zionist family of German-Jewish descent near Petach Tikvah. With a master’s degree in history from Ben-Gurion University of the Negev, she worked in an Israeli NGO fostering religious-secular dialogue. At the time they received the offer to head up Morasha in Munich, they lived in the city of Lod, where as volunteers they organized communal Shabbat dinners for destitute and at-risk locals. At first they, rejected the German offer. “We told them we have a pretty good life. Everything’s going well. We have successful careers. We felt good with ourselves, even ideologically. So give us a break,” Eliezer recalled at a Berlin cafe. He felt comfortable sporting his knitted kipah there, despite a spate of attacks against Jews in the city of late and a Jewish community advisory to avoid wearing skullcaps in public. Across the street was the heavily guarded Orthodox Brunnenstrasse synagogue complex that also houses a nursery school and rabbinical seminary, which are enabled by the Ronald S. Lauder Foundation (as is Morasha). 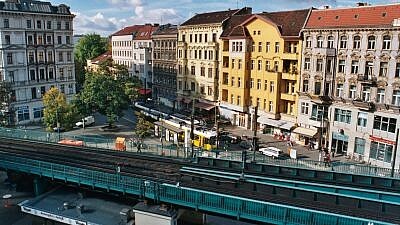 After three years in Munich, they moved to the residential Berlin campus located in the upwardly mobile neighborhood of Prenzlauer Berg, and which includes their home, dorm apartments, a learning hall and an activity room where they also hold packed Shabbat and holiday communal meals. The Noys’ two children attend the Lauder Beth Zion Jewish day school nearby. Prenzlauer Berg neighborhood of Berlin, Germany. Credit: Wikimedia Commons. Tehila and Netanel Darmon, both 26, were recruited last year by an Israeli businessman involved in Jewish outreach who sought to connect Israeli Berliners with their roots. Today, the couple directs Zusammen (“together” in German), which provides social and cultural activities in Hebrew. The Darmons had built a track record of Jewish social entrepreneurship in Goa, India, where they set up an “open house.” There, they served Israeli travelers who often came to them for Shabbat meals and, sometimes, for respite and rescue from at-risk behavior common to Goa partiers. Netanel grew up in a Yishuv Ma’on in the Hebron Hills; Tehila in Beit Shemesh. Their last address before moving to Berlin was Bat Ayin, known as a hippy-ish community in Gush Etzion near Jerusalem. “We knew there were many Israelis [in Berlin], but when we heard ‘Berlin,’ we thought: ‘What? Berlin? No!’ I immediately thought something very dark and unpleasant,” Tehila recalled from their apartment located a few blocks away from the Morasha campus. Zusammen and Morasha are separate organizations, but they sometimes assist each other. Tehila usually sports a colorful, turban-like head-covering while Netanel wears a hat in lieu of a kipah, hiding long, red tendrils. Although the Darmons’ prejudices against Berlin were not assuaged during a pilot trip, a sense of mission seized them. Germany’s Jewish population is an estimated 200,000. The crux of its Jewish community consists of Jews from the former Soviet Union who were invited to Germany in the 1990s. Most lost their connection to Judaism under communism. While the Noys naturally serve Israelis, their main activities are geared towards Jewish internationals or German Jews. Among the estimated 100,000 Jews living in Berlin, some 20,000 are believed to be Israeli. Under the Noys’ leadership, Morasha’s staff went from two employees to six, in addition to 80 volunteers. Their activities include Shabbatons, extensive learning programs and “belated” bar and bat mitzvahs for Jews who discovered Judaism later in life. After eight months, Zusammen has outgrown the Darmons’ apartment. They are currently seeking a larger campus, proving initial skeptics wrong. They introduced Zusammen on an “Israelis in Berlin” Facebook page. Ultimately, Israelis who at least on the surface appear as if they would shun a traditional Shabbat meal—with their tattoos, alternative lifestyles, left-wing politics, and non-Jewish partners—have become Zusammen regulars. The success of both couples can be attributed to their personal warmth, openness, non-judgmental attitudes—and, of course, home-cooked Shabbat and holiday meals. The respective wives take great pains to chop the array of hallmark Israeli salads with the help of volunteers. They serve meals on proper dishware, rather than paper or plastic to create a homey atmosphere, appealing as well to the vegan-friendly, environmentally conscious vibe of Berlin. Their respective multilingual children (the Darmons have three) wander about and chatter with the guests. Eliezer and Rotem Noy. Credit: Courtesy. Idan Chabasov, a 32-year-old gay, Israeli, high-tech professional living in Berlin for the past four years, attends the Noys’ Shabbat dinner twice a month. Karen Golub, a high-tech professional who traded Tel Aviv for Berlin last year, sought an Israeli communal outlet to ease some loneliness and cultural alienation she felt in Germany. The Noy and Darmon families have also softened to Berlin. Rotem lives not far from the former residence of grandparents who fled Germany in the 1930s. And while she’s eligible for German citizenship, which comes with a host of economic and social benefits, she’s not looking to redeem it any time soon.